... Turn on tub faucet for the best bath of your life in Clean, chlorine-free water! 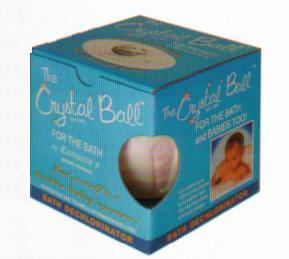 The Crystal Ball for the Bath provides chlorine-free filtered bath water that is safe for babies and tender skin. It prevents dry skin by dechlorinating the water in just minutes. Chlorine-free water restores a healthier, younger-looking skin. Media replacement is quick and easy. The outer shell of the Crystal Ball for the Bath is a 4-1/2 inch, white, pearlized, polyprop plastic housing with snap closures. The media pouch is enclosed inside the Crystal Ball. After about twelve months of usage or 300 bath, whichever comes first, we suggest replacing the media pouch. To do so, simply unsnap the housing, remove the old pouch and replace it with a fresh one. The pouches are available in aqua, pink, lavender and ivory. The media pouch and its contents - 90 days. Safe for infants, adults, and pets. Non-toxic. No plumbing or fittings. Just place in bath water. Portable. You can take it with you wherever you go.